The history of Hope Township started with the Chippewa Indians, who were in the area when Midland County was being formed. Originally, there may have been as many as 2,000 to 2,500, but by 1865 there were only about 200 living in the area. Ora Howsner is thought to have been Hope’s first settler. His son, Clyde, who was born in 1861 is said to be the first white male born in the area. Two other settlers who came in 1856 were Orrin Maltby and Joseph Rooker. William and Agnes McCrary came soon afterwards. The first marriage was performed in 1856 between Silas Wright and Louisia Erway. Other early family names were Braley, Card, Dunning, Fillmore, Frazier, Gleckler, Goff, Havens, Henry, Hosner, Inman, Kelly, Keys, Marsh, Maxwell, McWilliams, Mills, Raymond, Schearer, Shepherd, Trowbridge, Weaver, Wendt, Wilcox, Weaver, and Wisner. By the 1880 census, there were 89 different families residing in Hope Township, and by the 1894 census that number had grown to 167 families. Many of these early settlers are listed in the “Portrait and Biographical Album of Midland Co” published in 1884 and many of their decedents are still living in the township. We also have several centennial farms in the area. 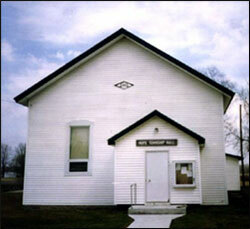 The Hope Township Hall which was built in 1881 is still used today. Hope Township was officially organized in 1871 with Ethelbert J. Brewster serving as it’s first Supervisor. Other supervisors were A. J. Raymond, Simon Gleckler, Timothy Fillmore, William Mills, William Schearer, Erwin H. Inman, Andrew J. Rogers, Warren Rogers, Wallace Hull, Herman Wint, Clair Schearer, Gene Smith, Ted Wendt, Mike Kressler and the current Supervisor, Andy Kobisa.When you consider the early years of the township, one consideration is that on March 11, 1876 the area that is now Mills Township was attached to Hope from Midland Township. It was later detached on October 15, 1894. The same is true of Lincoln Township. It was added in 1877 and detached in 1878. Postal Services opened in Hope on January 11, 1871 with Marshall Carr as the first Postmaster. Other names who served as postmaster include David Wilcox, Mrs. Chambers, Charles Harper, Billy Williams, Nellie Wilson, Frederick Benedict, Boyd Havens, Darlene Edmonds, John Elmore, Joann Wirth, Ernie LaFave, Cathy Koehn, and the current postmaster Paul Stephenson. During Boyd Havens’ tenure, his building burned down so he purchased the old Macabee building. That building later became John Elmore’s home and the present post office was built in 1982 just down the street from the old building. In the late 1880’s there were two general stores, a shingle mill, a blacksmith shop, a cheese factory, schools, churches, a Town Hall and a Knights of the Macabees Hall. Timothy Fillmore built the first store and Billy Harris was the first blacksmith. Hope Township’s first cemetery was created on land purchased from Aaron Havens. Burials started at New Hope Cemetery about 1911. Burials can still be in either cemetery. The Old Hope Cemetery is located on East Baker Road with the first burial date of 1862. The New Hope Cemetery is located on Schearer Road and was purchased from the Harris family. Hope Township is the site of one of Midland County’s Ghost Town known as Pansy. Pansy was located at the corner of Middle and Curtis Roads. John W. Crawford became their first Postmaster in 1887 but the Post Office closed in 1906. Pansy also had two general stores operating out of the Angles and Dundas homes. Another Ghost Town known as Joliet was located on Bombay Road in the area that became part of Mills Township. The postmaster there was Mary Healy Keely, but the mail reverted back to the Hope Post Office around 1896. Hope Township has a long history for the love of sports. 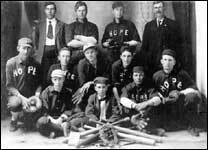 Pictured here is the 1910 Hope Baseball Team. Our Woodside Park has been a recent addition to the township being created in the mid 1980‘s. Pictured here from left to right are the following: (front row) Bob Joynt, Charley Mallory, Johnie Carey, Will Henry, Fred Swartz, Archie Henry, and bat boy Dennie LaRue; (back row) Marvin Earley, Charley Warner, Leon LaRue, and George Gregway. 1971 brought the construction of our Fire Station which is manned entirely by volunteers.